The Smart Enterprise innovates by leveraging the best and most current information technologies, tools, and products. With NEC’s UNIVERGE® SV9500 Communications Server, smart enterprises are empowered by technologies which optimize business practices, drive workforce engagement, and create a competitive advantage. The UNIVERGE SV9500 is a powerful communications solution that is designed to provide competitive businesses with the high-efficiency, easy-to-deploy technology that they require. Reliable, scalable, adaptable, and easy-to-manage, the SV9500 is built on cutting-edge technology that supports Voice, Unified Communications and Collaboration, Unified Messaging, and Mobility out-of-the-box, all the while remaining easy to manage. This robust, feature-rich system is ideal for geographically distributed businesses and enterprises. It is designed to help solve today’s communications challenges and offers easy integration with NEC’s unique vertical solutions. 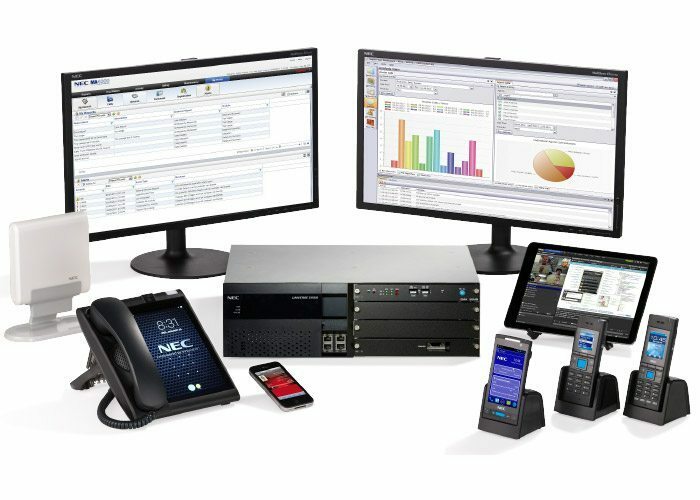 The SV9500 gives you the option of a fully virtualized communications solution. In virtualizing your unified communications applications, your organization can get the same great benefits you’ve realized from premises servers in the past, while reaping several new abilities; like the capacity to deploy applications faster, increase performance and availability, and automate operations—resulting in IT that’s easier to implement and less costly to own and maintain. The UC Contact Center suite supported on the SV9500 provides you with all the tools necessary to make each interaction between your customers and your business quick and easy. Between improved response times, reduced abandon rates, lower operating costs, and increased revenues, both you and your customers will see a return on your investment. The SV9500 easily integrates with your existing IT technology as a fully interoperable IP or digital system. The user-friendly management interface streamlines system administration, giving your IT department one personalized portal to administer the entire communications system—Voice, Unified Communications, and Voicemail—all from one central location.